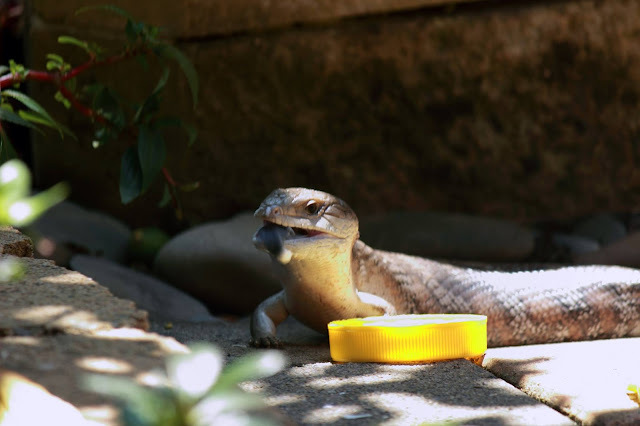 One of the largest lizards commonly found in Australia are Blue Tongue Lizards, with their bright blue tongues, they are very easily identified. To encourage this good critter we need to provide an environment they enjoy - a warm, sunny spot near shelter. This shelter is usually gaps between rocks or bricks, in a wood pile or in a clay pipe. The clay pipe is an excellent home if you want to provide one. They LOVE snails, slugs, caterpillars and beetles and are renowned for tucking into tomatoes and strawberries. They don't enjoy snail and slug bait which poisons them when they eat affected foods. Cats and dogs aren't really good companions for Blue Tongues as they can frighten them or even by playing with them cause them harm. They also do not enjoy being handled as they particularly dislike losing contact with solid ground. If you have a Blue Tongue Lizard in your backyard, count your blessings and let him/her reign supreme in the snail and slug annihilation.